LODGING - Dribble for Destiny, Inc. Stunning views. Quiet, still waters. Wildlife in its natural habitat. This and more is what you'll find at Lakepoint on the Saluda. 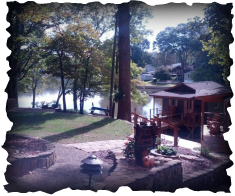 Better yet, this property is located on the water and is just minutes from downtown Greenville, SC, Paris Mountain, Furman University, and the Swamp Rabbit Trail. A perfect place to study, relax, or retreat. Don't forget to bring your kayak and bike! The Main Lodge sleeps six, is fully furnished and includes three bedrooms and two full baths. The Boat House is a fully furnished two room cottage that sleeps four. The Cabin, a fully furnished efficiency cottage, sleeps two. Long and short term rentals are available for the Cabin and Boathouse. Short term rentals are only available for the Main Lodge. Please contact the office at info@dribble4destiny.org if you are interested or visit https://www.airbnb.com/rooms/3838761.